Just like milk is a primary nutrient for life, Leather Milk is a vital nutrient for your leather. 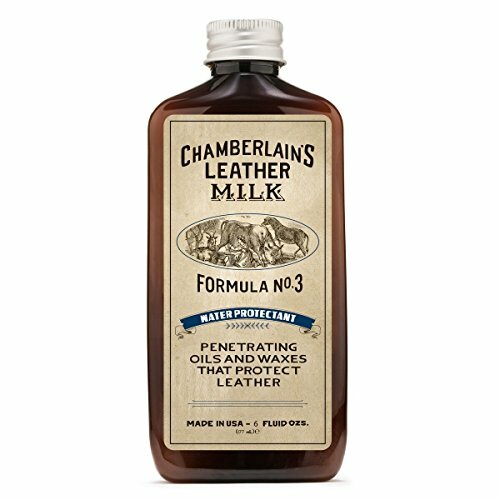 Originally designed for and recommended by Saddleback Leather Company, Chamberlains Leather Milk Water Protectant No. 3 is a weather repellent containing deeply penetrating all-natural oils and waxes that protect and condition your leather. Water Protectant No. 3 is also 100% Made in the America. Our all-natural recipes are designed to gently condition, clean, strengthen, preserve, beautify and restore your leather without overloading it with heavy cream, honey oils or toxic chemicals. Whether you are hunting, fishing, hiking, riding or camping, Water Protectant No. 3 is ready to brave it all. Through the rain, mud or snow you can rest at ease knowing your leather is safe. Chamberlain’s Leather Milk (Leather Care Liniment No. 1) is used on all Saddleback Leather Company’s products before the items are shipped to their customers. -Auto upholstery, your favorite leather handbag, briefcase, wallet, jacket, purses, shoes, red wing boots, saddle, tack, outdoor coats, gloves, hunting boots, motorcycle gear, leather furniture, auto leather, apparel, and accessories. -Read all instructions before use. Leather Milk is not for consumption. -Use carefully on unfinished leather. Not for use on suede. -Ensure a wax-based conditioner is recommended for your leather. Test in discrete area before using.EASY TO APPLY. PROTECT FROM THE ELEMENTS. RESTORE LEATHER TO NEW. WATCH WATER BEAD UP AND ROLL OFF – Chamberlain’s Leather Milk Water Protectant No. 3 is a non-sticky, no mess protection cream that allows you to easily and quickly apply to repel water. Deep Conditions and protects from liquids. Rest knowing your leather is safe even in the most harsh weather conditioners. ALSO WORKS TO WATERPROOF INDOOR LEATHER – Do you have young kids (or adult kids) who spill their drink on the couch? How about in the car? Water Protectant No. 3 is perfect for any leather that might come in contact with harsh conditions, chemicals, or liquids. CHEMICAL FRE – By using the Chamberlain’s Leather Milk No. 3 you can save your leather from the damage caused by chemically based products. Also, from noxious fumes and any unpleasant smell. Our blend of natural waxes, oils, and fragrance will extend the life of your cherished leather while preserving that original leather smell. ONLY LEATHER CARE RECIPE TRUSTED BY SADDLEBACK LEATHER COMPANY – Tested on millions of leather items over the years. Saddleback makes some of the best looking, highest-quality leather goods on the market. Each and every Saddleback Leather product is conditioned with Leather Milk before shipping to customers. MONEY-BACK GUARANTEE – If you aren’t satisfied for any reason we will give you a 100% refund.